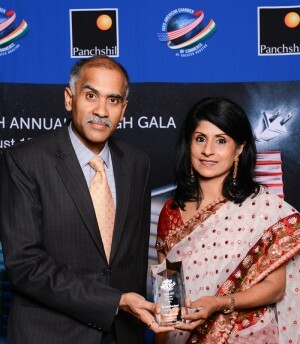 Houston’s Consul General of India Parvathaneni Harish presents Dean Latha Ramchand with the Indo-American Chamber of Commerce of Greater Houston’s 2013 Educator of the Year award at the organization’s 14th Annual Gala. The Indo-American Chamber of Commerce of Greater Houston recently honored Latha Ramchand, dean of the C. T. Bauer College of Business at the University of Houston, as the 2013 Educator of the Year. The chamber also presented awards to Ash Shah, International Businessman of the Year; Dhiren Shethia, Business Person of the Year; and Guarav Khandelwal, Entrepreneur of the Year. The IACCGH mission is to facilitate commerce between the United States and India, to facilitate access to the Indo-American market, to be the voice of the Indo-American business community and to enable Greater Houston professionals, businesses and corporations to succeed.